Last time I examined three retroclones--Adventurer Conqueror King System, Crypts & Things, and Swords & Wizardy--to see how they handled some of the issues surrounding actually getting the information within them to the reader. Today I want to continue that by looking at a few other OSR games. Blood & Treasure tends towards a photo negative of ACKS--functional, but not very interesting--but whereas ACKS gets this effect primarily by drowning you in grey, B&T gets it by flooding you in white. This first picture is a good example. The chapter header idea is visually interesting, on a single-page basis. However, the fact that it's always left-aligned, but can occur on either an odd or an even page, means that sometimes it will be on the inside of the page (towards the spine), making it harder to notice that you've hit the chapter you may be looking for when flipping through it as a print book. If the author was determined to always have it left-aligned, strategically placed full-page art would ensure that new chapters always occurred on even-numbered pages (so the chapter header would be on the outside left). Even then, it would be better on the right, because always-left can be more easily missed when flipping, due to our vision orienting to the right side when flipping through a book from front to back. There's also the centred page number, which also contributes to poorer page flipping. A big part of making B&T visually monotonous is its heavy reliance on uniform spacing. All sections have the same padding, and there's no indents. 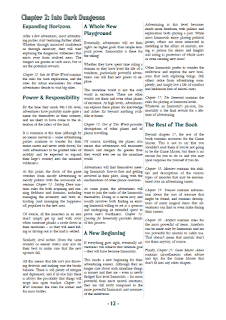 The section headers, unlike Swords & Wizardry, are only bolded versions of the standard B&T Cambria 9.5 point font (though using extra half-points in your fonts is a good choice: sometimes one point is too much either way, and many people miss that you can adjust things in this granular a fashion). The larger headers are just 11 point, but still the same case: all-caps would have helped a lot. Overall, it doesn't do a good job in helping the eye immediately break out sections. At the same time, just look at this. I love this so much. 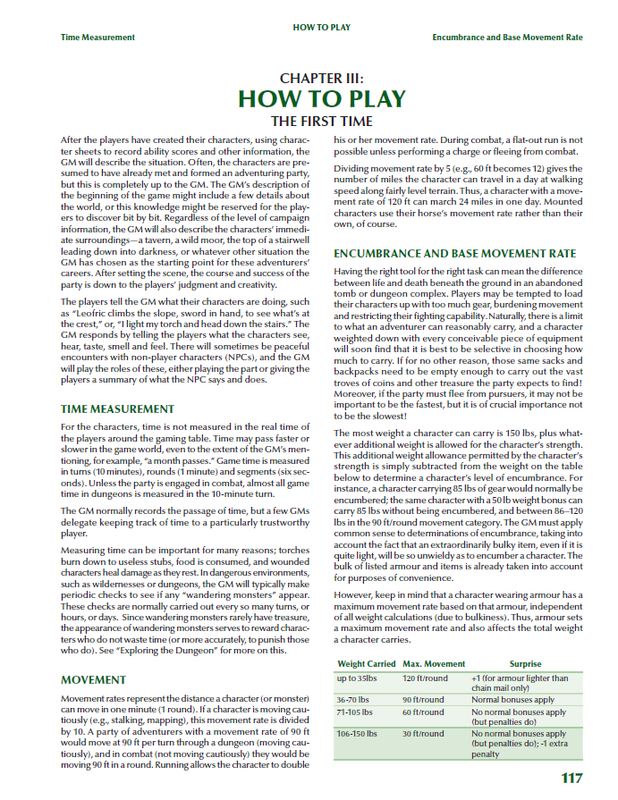 Yes, you could cram all that movement info into a table and be done with it. But this is so much more visually interesting, and by collecting each creature's relevant info under it while siphoning off all the rest, it's easier to read. Of course, this comes at the expense of space, and it wouldn't work for all tables, but I'd say the trade-off is worth it here. Dark Dungeons is a bit unique amongst retroclones in that it aims to replicate the late Aaron Allston's Rules Cyclopedia, rather than the usual B/X or OD&D fare. I think it's essential to any worthwhile review of a game that the reviewer understands what the author was going for. At the same time, it's perfectly fair to question whether or not what the author sought was worth pursuing in the first place. The original Rules Cyclopedia, being a compilation of Frank Mentzer's BECM rules series, was a whopping 304 pages (and still didn't manage to get everything in). Any clone is therefore going to be faced with the serious problem of how to manage all this material. Dark Dungeons comes in at 342 pages. How does the author tackle this information dump? Regrettably, I would not say very well. DD has gone with a slightly larger font, line breaks after each para (instead of the Cyclopedia's indents), and more padding around its section headers, but none of this really solves the basic cramped feel that the Cyclopedia had. 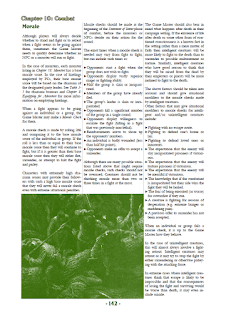 The main issue is keeping the Cyclopedia's three-column layout, and in particular DD's decision to drastically cut down on the space between columns compared to the Cyclopedia, which really counteracts a lot of what DD improved elsewhere. That's not to say the result is unreadable: I have no trouble getting at whatever the author is trying to convey at any given point. But perusing this for any serious length of time would be tiring, and it's certainly not a pleasure to look at. 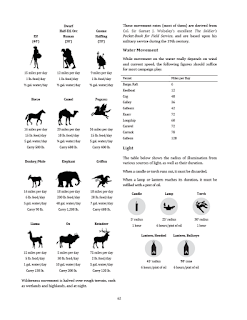 Above is a random Rules Cyclopedia page, for comparison. Notice the wider column spacing, and the way the chapter titles are offset up top inside header boxes. 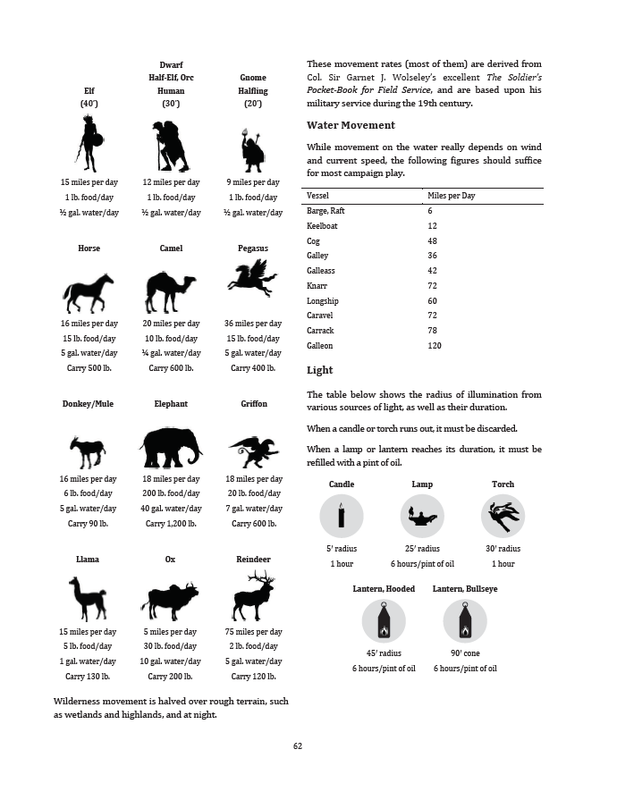 It's still way too busy for my liking, but despite some of the extra space DD devotes to its text, I have to say I think I'd still prefer to read the Cyclopedia, simply due to that wider between-column spacing. My god that footer design does a good job of hiding the page numbers, though: for a while I thought the book didn't even have them. In DD, the chapter titles are at once clear (reasonably sized, placed right up top) yet squished, as they have very little padding below them. The book is broken into major "parts". These are colour coded, so that the headers, example text, and even art shading is consistent for each part. Normally I'm in favour of organization tricks such as this, as anything that subtly guides the reader is generally a good thing. But the parts of the book (as opposed to its chapters) are so big that the visual cue winds up being rather meaningless. 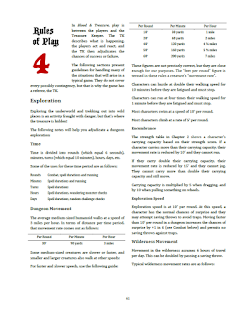 Part 2 runs from page 17 to page 108, and contains all of character creation plus magic. What does a reader knowing that they're in "Part 2" really gain? All it really winds up doing is obscuring the images used in each part with the chosen Part hue (green, in the example image above). Ultimately, the feeling I get from Dark Dungeons is that they've tried to tackle what really is an editing job with layout tricks. The Cyclopedia is very conversational, and DD matches that. But when you've got hundreds of pages, I think the best approach would be getting pretty ruthless with the "storytime with Uncle Allston" prose--fetching the red pens and getting down to business. I have no doubt I could shave 50 pages from this, and use the extra space to perhaps switch to a two-column approach; overall, I think this is a case where slavish adherence hurt the project. I can't stop laughing every time I come across Black Leaf and Elfstar in the DD examples, though. 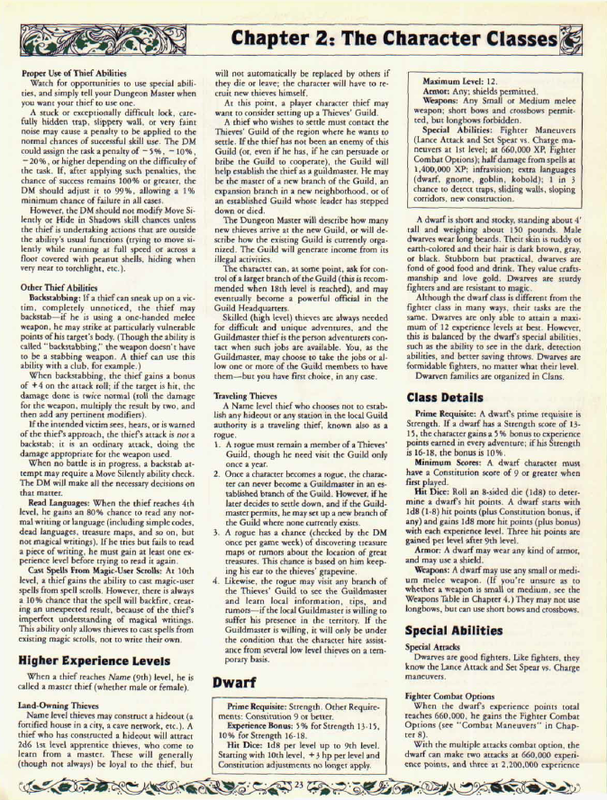 OSRIC is a 1st edition AD&D clone. Like Dark Dungeons, this obviously informed its layout and general aesthetic approach, but I think OSRIC does a much better job of squaring the circle of fidelity to the original source material while at the same time making improvements to that source. 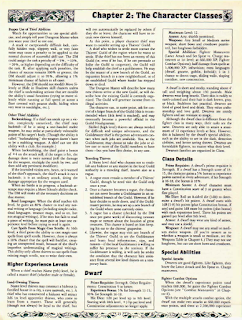 OSRIC uses the same column spacing as the 1st ed DM's Guide, and a sans-serif font as well (although it's Optima in the new book vs. the original's Futura). Also used is the line-break-instead-of-indent paragraph style. The overall effect is very clean, and I really admire it. I particularly like the use of colour, similar to ACKS. However, here it's used as table, page number, and chapter header shading, instead of ACKS' keywording. I like how large the corner-placed page numbers are: you can't miss those when page flipping. Honestly, Lamentations makes me laugh. Not because it does a bad job, but because its layout in some ways matches the tone of the book's art (as seen below I only have the artless free version, but shots of its art are easy to come by). The fact that you have no doubt what sections are being covered above even though you're viewing just a thumbnail is basically what I mean. It's just HEY, DO YOU LIKE SWIMMING? WE'RE TALKING ABOUT SWIMMING. 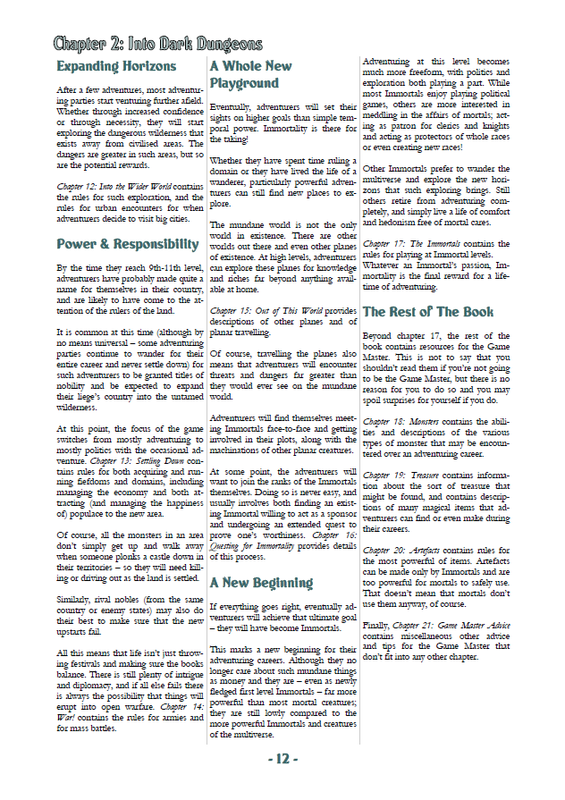 24-point font for some books is reserved strictly for chapter headers. LotFP laughs at your puny girlyman chapter headers: here it's for mere subsections. It's huge and screaming and in your face. I would be lying if I said it didn't work at the essential job of layout: conveying information effectively (and the book is well organized too). 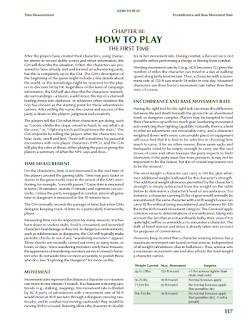 It's just a bit too Tarrasque-school-of-layout for me to ever want to use it myself. In my last post I looked at Crypts & Things and threw out an offhand comment about how fancy fonts can give character to chapter headers and other, similarly larger headings where all the greebles on the font don't impede your ability to view it because it's at so large a size. At the same time, I cautioned against using such fonts for smaller headers. Blueholme's original printing made that mistake. This is at 100% magnification. Even then, it's headers are rather hard to read; looking at this at 75% magnification or so on a monitor is a nightmare. However, the author obviously realized the same thing, because viewing the October 2017 fourth printing shows that it's since been fixed. EDIT: I've been informed that this is actually due to a rendering error with my PDF / reader and that that printing didn't actually appear that way. Thanks Michael Thomas. 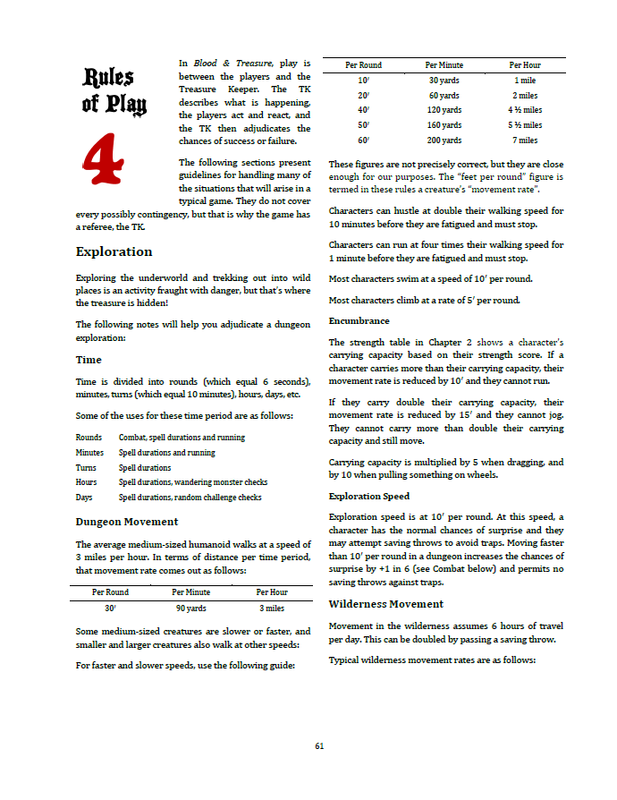 Okay, now that the scattershot overview of some aspects of some OSR games is done with, let's see what I can beg, borrow, and steal to put together my own. First, I like ACKS's and OSRIC's occasional splash of colour. At the same time, I don't want to overdo it, like colour coding my art (DD) or making all the tables entirely various shades of that colour (OSRIC). Second, I'm going to stick to a two-column layout, and make sure I don't try to gain space by cheaping out on the space in between the columns. Third, I'll want to make sure that my section headers are obvious, immediately guiding the eye like Swords & Wizardy's do. Fourth, I'm going to want to make sure my text boxes have better borders than just the default skinny line, so they don't look amateurish. Fifth, let's use nice big outside-edge page numbers. Those are good general guidelines, I think. Next I'll put it all together for Simulacrum, my own game.